CYCLIA is pure theater in a revolutionary new form: A perfectly controlled, unified environment of movement, images and sound. CYCLIA is an experience both powerful and exquisite, poetically simple and brilliantly abstract. It is cyclonic tornadoes of color, exploding images and torrents of flashing impressions. CYCLIA is a sensational glimpse into the inner contents of our times – a vital, living, expanding experience that consumes its audience. It is total involvement, total communication. CYCLIA is the entertainment experience of the future – theater of the year 2000. 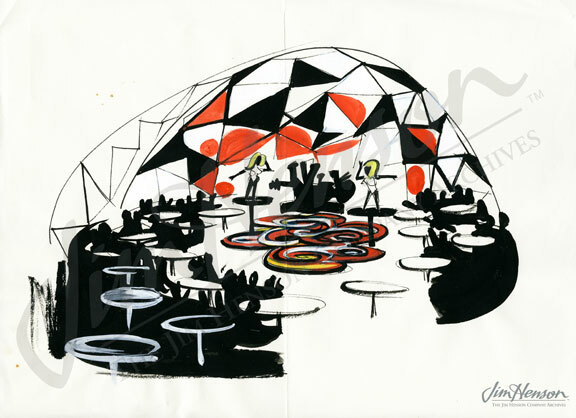 In 1966, Jim began a project that would incorporate his ideas for integrating sound, light and movement while capturing the bold graphics, revolutionary music and psychedelic styles of the mid-sixties: CYCLIA, a multi-media nightclub. 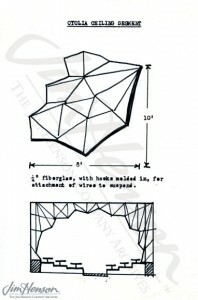 Jim envisioned an open room, large enough to hold about three hundred people, with walls and ceilings broken up by faceted, crystal-like shapes. A film presentation called “Cataclysm” would play three or four times nightly, projected onto the walls and ceiling by about a dozen 16mm projectors and accompanied by live music that would be timed to coincide with the images. Gentle ballads would accompany films of water, woodland surroundings and abstract patterns while driving rock music would underscore flashing images of neon lights, speeding traffic, machinery and op art patterns. Between sets, the dance floor would glow with colored, pulsating lights while recorded music played. 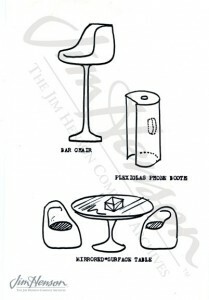 Always ahead of his time, Jim was anticipating the discos of the 1970s and 80s. Jim and his colleagues, Frank Oz, Jerry Juhl and Jerry Nelson, filmed hours of material for Cyclia. When any of them had some free time, he would go out with a 16 mm camera and shoot film or, back at the studio, experiment with projection techniques. Jerry Nelson remembers, “…riding on the back of [Frank’s] motorcycle, shooting.” He and Frank attended a Beatles concert at Shea Stadium and got permission to film the audience. The images of ecstatic fans were to be part of Cyclia’s entertainment. Jim began the serious work of scouting locations, talking to architects and sound and light technicians, and drumming up financial backers. In 1967, Cyclia Enterprises was incorporated with Jim as president and Barry Clark, a Los Angeles music manager, as vice president. The group looked into using inflatable structures like those that house tennis courts, building a geodesic dome on a vacant lot on Second Avenue, renovating the inside of a church, and redoing the interiors of existing clubs. Locations on both coasts were considered, plans were drawn up and furniture was chosen. But by 1969, the vision had not been realized, and those involved were ready to move onto other projects, most importantly for Jim, Sesame Street, which premiered that November. In 1970, the final legal releases were prepared, and four years of work on Cyclia were shelved as Jim Henson focused on a series of new projects for the coming decade. Watch film footage including some of Jim abstract animation for Cyclia. Jim’s concept for the Cyclia nightclub interior, c. 1967. 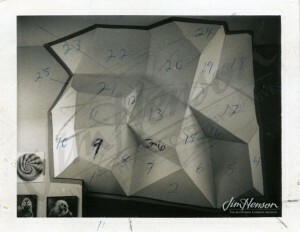 Jim’s plan for the faceted ceiling for Cyclia nightclub, c. 1967. 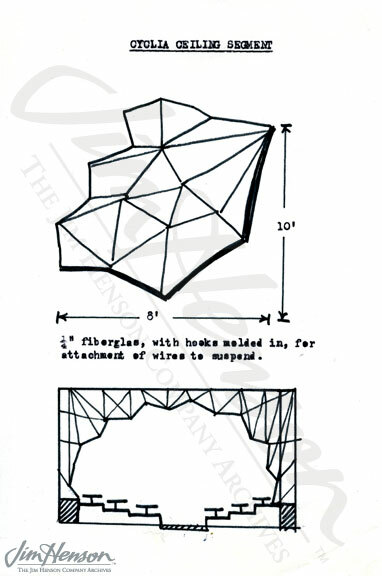 Annotated photo of mocked-up Cyclia nightclub ceiling portion, c. 1967. 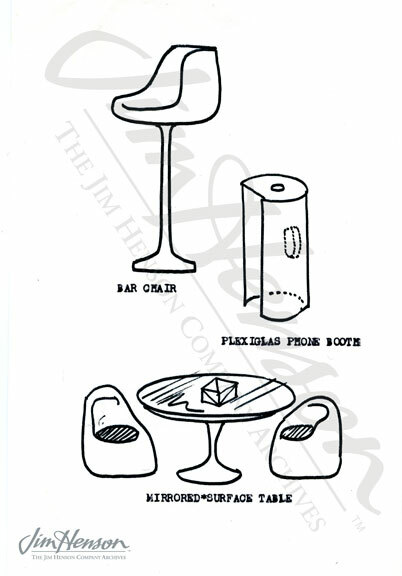 Jim’s ideas for Cyclia nightclub furniture, c. 1967. This entry was posted in 07-July '67, 1967, Appearances and tagged Barry Clark, Cyclia, Frank Oz, Jerry Juhl, Jerry Nelson, Shea Stadium. Bookmark the permalink.